I’ve been lucky enough to visit Tokyo twice. I could go there a hundred more times and probably still not know it but I can say that I love it. Have you ever been? It is a visual overload. That sounds a touch negative, doesn’t it? I mean to say that it’s a visual person’s heaven – something to see everywhere you turn – and I don’t think there is another city that I would want to travel to right now more than Tokyo. The other day I was watching a food travel show about Tokyo and the lucky fellow who hosted the show was able to visit the culinary underworld that is evolving there. As they filmed the streets of Tokyo, the subways, the restaurants, the fish market, I wanted to burst through the screen to get to where they were. As a designer, I love the way they design everything there so much because of their attention to every detail. Just about everything is designed and designed well. Works of art everywhere you turn. 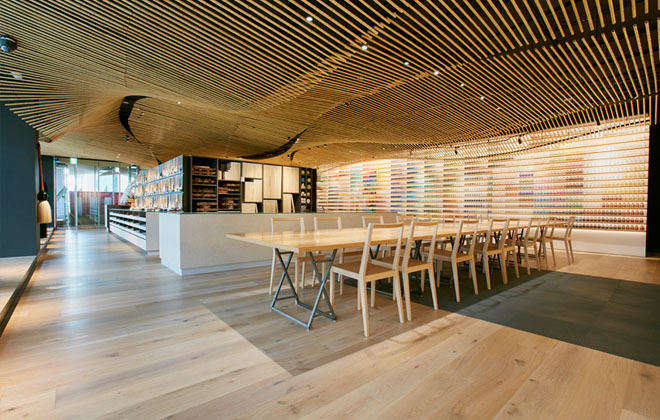 When I saw the photographs of this new art supply concept store, I thought this is a work of art in itself! It is just beyond beautiful with every aspect considered from the walls to the smallest jar of paint and every brush in between. It’s done in such a way that only the Japanese can pull off. 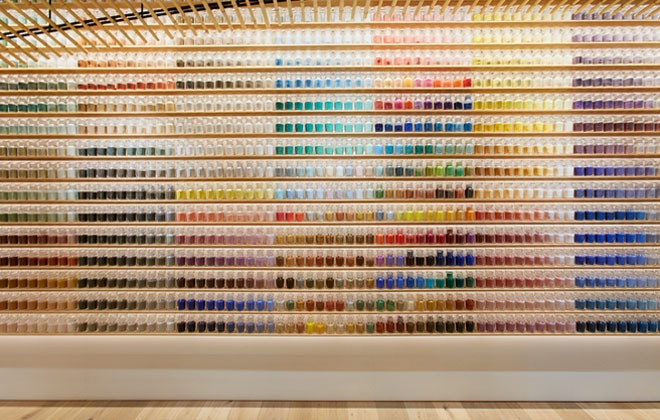 The art supply store, aptly called Pigment, has been beautifully designed to show off all 4,200+ pigments they have available as an installation that takes up one entire wall of the store. All of the different colors are lined up perfectly in clear glass jars, creating a jaw-dropping gradient of color throughout the space. 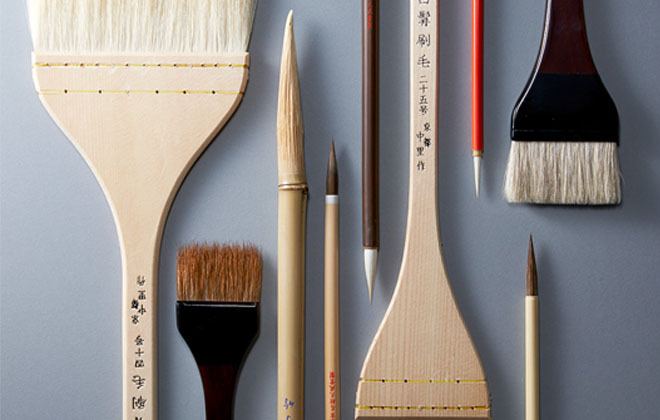 There are also curated displays of artists tools such as brushes, mixing bowls and containers, along with other traditional art supplies throughout the store. Pigments stunning wall displays of brushes. Even the ceilings are fantastic. And the brushes are thoughtful. 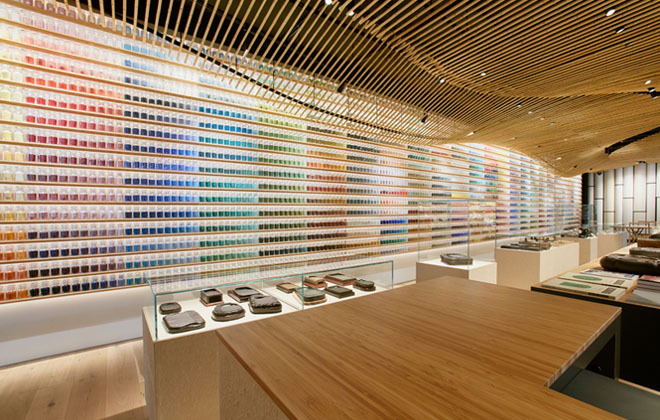 Walls of pigment choices make a rainbow of colors that undulates around the store. 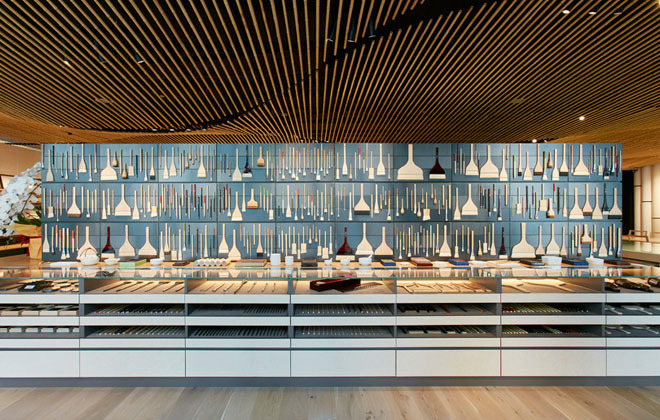 The focus on this store is to truly act as a lab, letting people explore these ancient and modern supplies to rediscover all the possibilities that pigments provide. 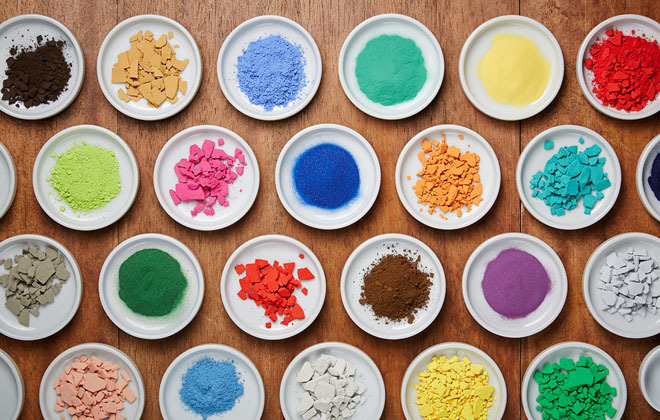 Pigments have been used for thousands of year in Japanese art, and the store is devoted to preserving and promoting the use of these traditional materials in contemporary work. Warehouse Terrada teamed with world-renowned architect Kengo Kuma to create an open and inviting space where people can learn and discover, and of course – shop. The results are gorgeous. Talk about a visual feast everywhere you turn! Makes you want to paint something, doesn’t it?